BAS or EMS: Which Is Right for Your Facility? There is much confusion regarding the differences between a Building Automation System (BAS) and an energy management system (EMS). Although many facilities experts will use the terms interchangeably, energy management systems and building automation systems serve very different functions. A traditional BAS (a.k.a. BMS) automates functions such as HVAC controls, lighting, access control, alarm systems, and security cameras. Basically, it’s a platform that allows several dissimilar systems (or functions) to be controlled from a central location and allows routine automation of turning on/off HVAC, lights, and security as the building becomes occupied or unoccupied. Of course, this means some level of ‘scheduling’ can be achieved. Conversely, a conventional EMS system provides the detailed data, alerts, and reports necessary to properly adjust the various systems in a building for maximum energy savings. A common analogy is to consider your building to be like a car. 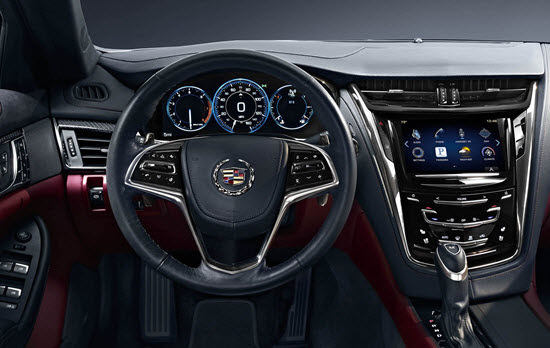 The BAS/BMS would then be the steering wheel, accelerator and brakes, and the EMS system would be the “dashboard” data to include the fuel gauge, speedometer, tachometer, warning lights, etc. Over the past few years it has become hard to differentiate between these two systems. This is because EMS functionality has been added to many building automation systems and vice versa. 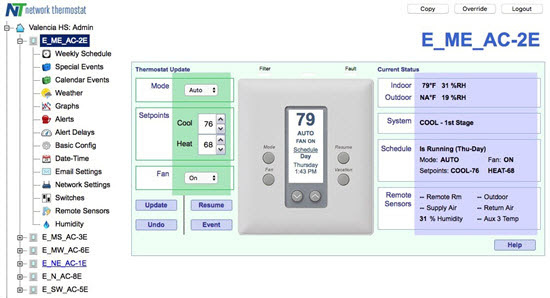 Network Thermostat energy management systems have incorporated the best features of the building automation system with the data and analytics of an energy management system to allow facility managers the ability to automate HVAC controls while providing the necessary data to optimize the system for maximum energy savings. Due to the complexity of integrating and automating the HVAC, lighting, security, etc. into one platform, the vast majority of BAS systems are only used to control the HVAC. Most small and medium sized facilities find the cost of a BAS/BMS to be prohibitively expensive and too complicated for controlling just HVAC. The cost of equipment, installation, system updates, and ongoing maintenance fees makes the return on investment (ROI) on a BAS system on the order of several years. So what makes Network Thermostat different? A LOT. With the power of today’s electronics and ‘Internet of Things’ (IoT) capabilities and coupled with Network Thermostat’s 20+ years of communications-based HVAC control, the NetX energy management solutions give the power, simplicity, reliability, and flexibility needed. They are affordable, portable systems that provide a typical return on investment in ONE YEAR OR LESS. Powerful algorithms provide optimal occupant comfort while maximizing energy savings. Network Thermostat’s 100% stand-alone solutions are capable of operating in the cloud (you’ll love our CloudConnect Service Dashboards) or behind a network firewall to maintain network security. Free, world-class Net/X-IP Command Center PC application provides a powerful dashboard to all of your energy management projects across multiple facilities and 3rd party system integration allows the software to act as a single interface to all of your web-based communicating building systems (security cameras, door locks, lighting controls, etc.). In addition to the Command Center software, there are multiple remote accessibility options to include DirectConnect, CloudConnect Services and VPN access to the Command Center. 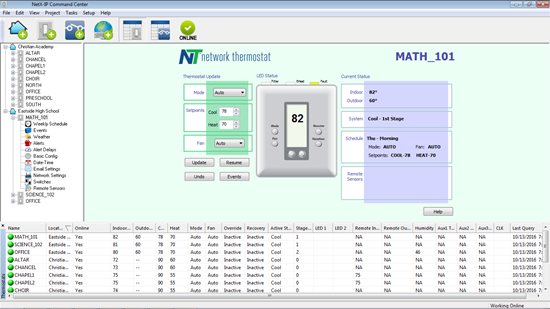 Network Thermostat energy management systems provide similar functionality to full blown BAS/BMS systems at a fraction of the cost. Flexibility is at the heart of every Net/X energy management system. All UP32/RP32 thermostats control conventional gas/electric (2H/2C) and heat pump (3H/2C) systems and the UP32H/RP32H can also manage humidifiers/dehumidifiers and/or fresh air dampers. A lock-out feature limits temperature overrides to ±3oF or ±5oF and includes an adjustable override timer. Use the recirculation fan timer to optimize airflow within the conditioned environment. Integrated real time weather forecasts, based on local zip code, eliminate the need for outdoor sensors when setting heat pump balance points or controlling fresh air dampers. Special algorithms even lessen energy usage peaks by minimizing the number of HVAC units that can turn on at the same time. The UP32xE/RP32xE Internet thermostats allow point and click control from almost any browser on any device from any Internet access point. An extended hold (vacation) is quickly created from an internet connection or the thermostat front panel by simply entering the day and time to return to normal scheduling. Network Thermostat’s powerful Event Scheduling engine in the E models (UP32E, UP32HE, RP32E and RP32HE) allows up to forty (40) calendar-based events for multiple holidays and vacations, and up to forty (40) special events for extended hours and special one-time events. All versions feature automatic changeover 3-Heat / 2-Cool thermostats with programmability from just a single schedule to seven days per week with up to four events per day. The UP32 family also supports auxiliary inputs and sensors. Each UP32 version supports occupancy sensing, two (2) digital inputs for condensate switch, dirty filter or other fault condition, and an advanced remote sensor bus. The 3-wire remote sensor bus supports eleven (11) sensors with up to nineteen (19) alerts. All thermostat platforms support email and text message destinations for sending reminders and condition alerts to both customer and service personnel. 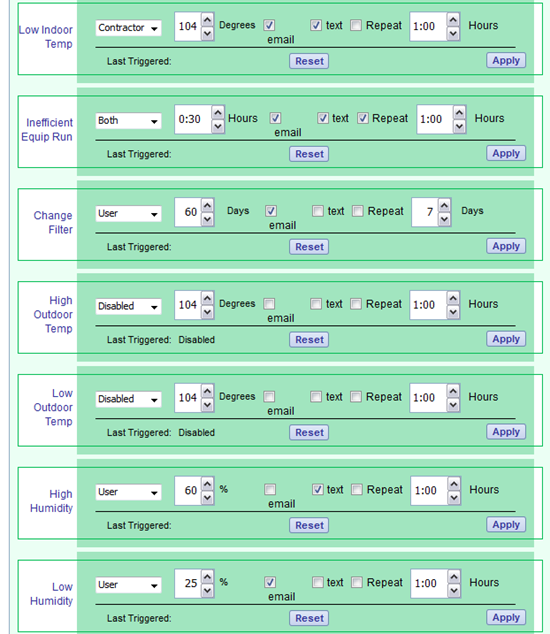 Simply enter the desired alert email addresses and phone numbers in the embedded secure email client. Critical Alerts can be repeated until the alert condition is corrected and reset. These alerts include temperature and humidity levels, filter change reminders and a powerful Inefficient Equipment Run alert. In addition to operating as a stand-alone energy management system, the Network Thermostat solutions can also be integrated into existing building automation systems using the economical NT-BAS BACnet Gateway or NT-BASR BACnet Router. 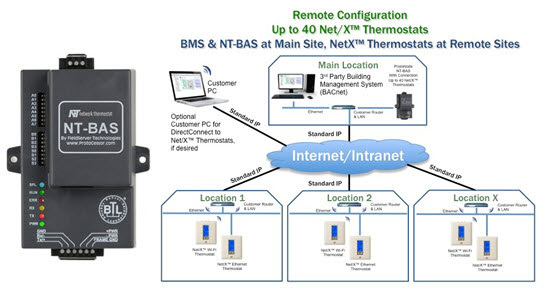 The NT-BAS/NT-BASR connects directly to any one of the powerful Net/X Wi-Fi and/or Ethernet platforms and translates the information to BACnet/IP, adding BAS support for all Net/X thermostats and remote sensors. The NT-BAS provides translation for BACnet MS/TP, BACnet/IP, Metasys N2 by JCI, Modbus RTU, and Modbus TCP. There configuration is as simple as setting the IP address on the NT-BAS and mapping the Net/X Thermostat model and IP addresses using the embedded web server. The NT-BAS can physically be placed anywhere in the world, on site or off. Due to intense features integration, today’s Building Automation/Building Management Systems and Energy Management Systems are extremely similar in many aspects. Both are capable of providing data and allow control over various automated functions within the facility. A key differentiator between BAS/BMS and an EMS is cost and return on investment. A flexible, powerful Network Thermostat energy management system provides similar features of a BAS/BMS and is typically installed at less than 50 percent of the cost. 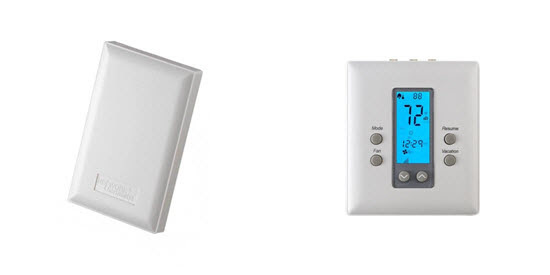 With free PC software, multiple connectivity options and no ongoing system maintenance fees, typical return on investment for a Network Thermostat solution is a year or less. Contact a Solutions Specialist to learn more about how a flexible, economical Network Thermostat energy management system can help you start saving on your energy bills today.